It’s been a little over a year since I started keeping bees. 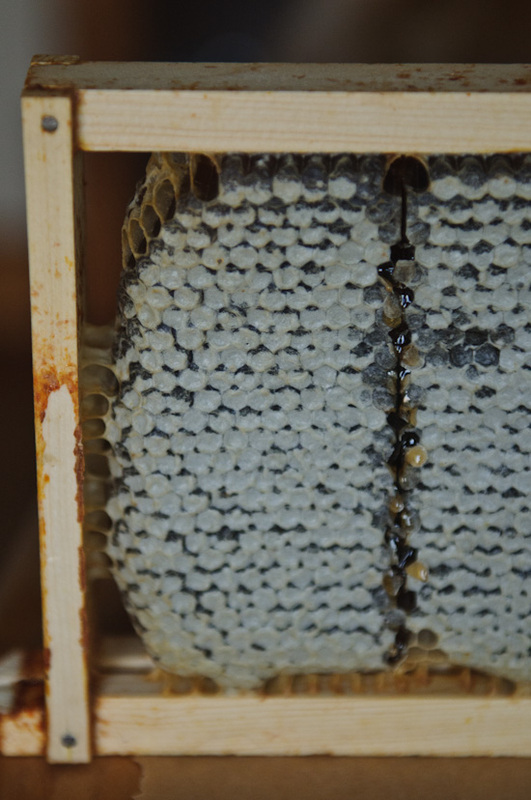 As I explained in this post back in July of 2011, I knew it was going to be a while before we’d be able to harvest honey from our hive. 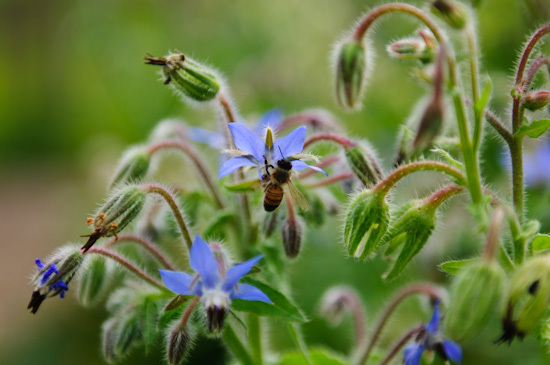 The bees need to have a good stash to get them through the winters, so it’s not right to take what they require to survive. I thought we might have to wait until next year, so I was pretty ecstatic when my bee “guru” Chris determined it was fine to pull out a few frames last week. 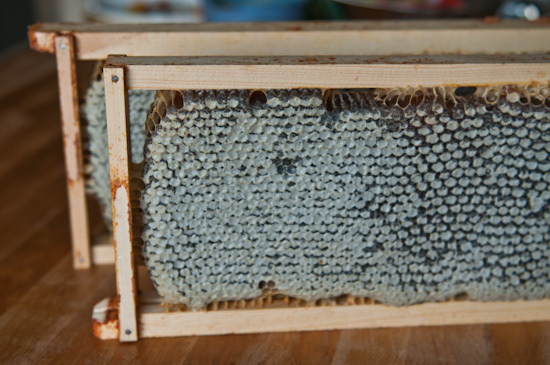 What you see here is honeycomb the bees have built on the frames capped with wax. …and placed them into a fine mesh strainer over a bowl. 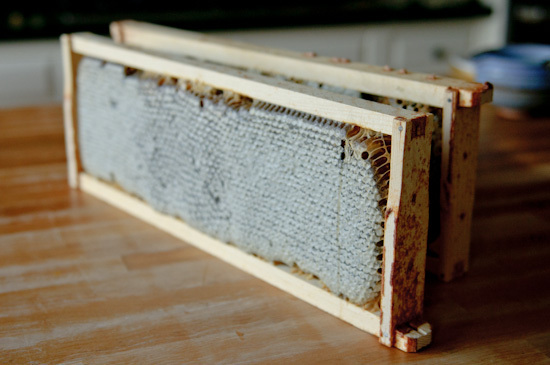 I then pressed each chunk down hard with a layer of parchment between the comb and my hands in an effort to not end up all sticky (but I still ended up all sticky), and the honey drained away from the wax into the bowl. It was a somewhat tedious and rather messy experience, and the honey’s not 100% wax-free, but I ended up with a substantial amount of dark, intensely flavored honey and I could not be happier. With the Jewish New Year Rosh Hashanah upon us, I decided to use some of my honey in a challah. 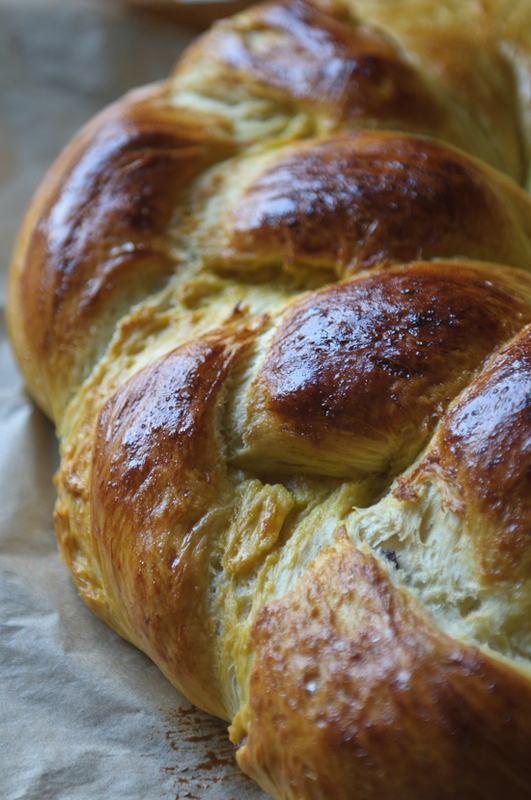 I make challah with eggs from my chickens, and I loved this recipe I made last year. I adapted the recipe just slightly by adding 1 cup peeled, chopped local apple, 1/2 cup of organic raisins, an additional 2 tablespoons of honey, and a bit of extra flour to the dough (I also omitted the sesame seeds on top as I didn’t think they meshed with the sweeter bread). This loaf came out really beautifully- absolutely giant- and it was perfect for our holiday dinner: a sweet bread to symbolize a sweet New Year to come! If you make the recipe, be prepared for a huge challah. We ate about a quarter of it with our Rosh Hashanah dinner, and we’re enjoying another quarter of it with breakfasts this week. I froze the other half in anticipation of challah French toast in the future…it’s my favorite way to use leftovers of this eggy bread. Next time I make this, I might add more apple and raisins. Because it’s such a big loaf, the amount I used is pretty well dispersed. I personally wouldn’t mind more bites of the fruit, but my family thought it was perfect as is. How interesting! Makes me want some honey bees myself now..
Shana Tova to you and your challah looks lovely! Your challah is gorgeous, Winnie. And, I love the color of that honey. Terrific post! 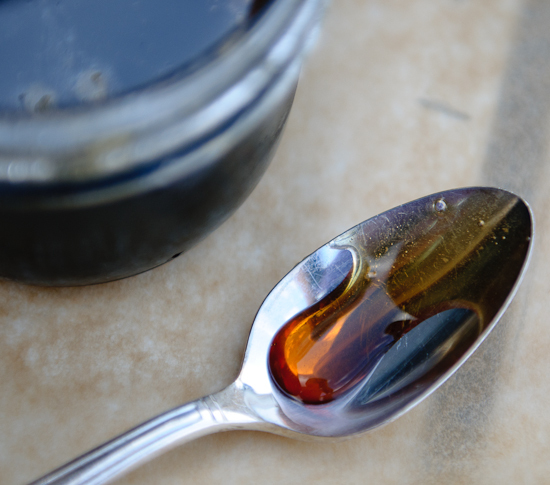 Love the photo with the honey on the spoon. And I like the idea of adding apples to the challah: I will definitely try. How lovely to have your own honey, I’m so glad you were able to harvest some just in time to use it in this challah. Winnie, this is such a beautiful bread! I love that you used your own honey! Thanks Winnie for the mention. I quite accidentally discovered it. Lovely challah with a beatitiful golden sheen you got there. Happy New Year! Shana Tova! 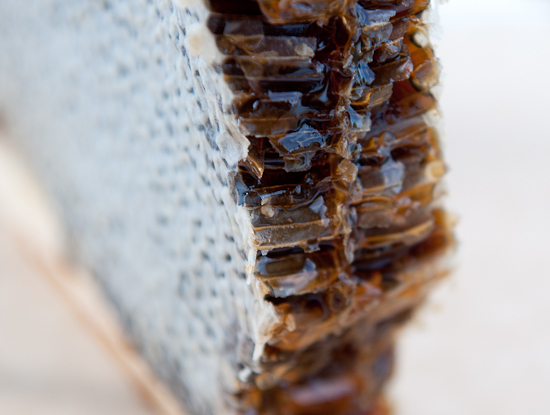 WOW…how fabulous it si to see this whole process and the gorgeous treats you make with your homemade honey. I may ned to find my own bee “guru” one day. 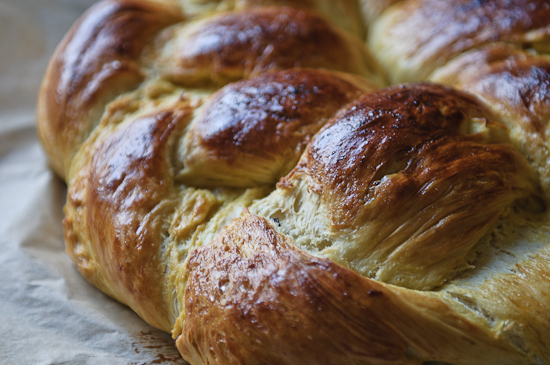 So exciting to see your honey – and your challah is absolutely gorgeous!! That challah is simply stunning, Winnie. This is crazy, but I don’t think I’ve ever eaten challah. I’d love to try yours. Congrats on the first honey harvest. Wishing your little bees lots of happy honey-making in the years to come! Your challah is a beauty. How lovely to have some of your own fresh honey in it along with eggs from you own chickens. Challah makes THE best french toast! I love reading about your bees, Winnie! Congratulations! You definitely have a sweet year ahead filled with honey. 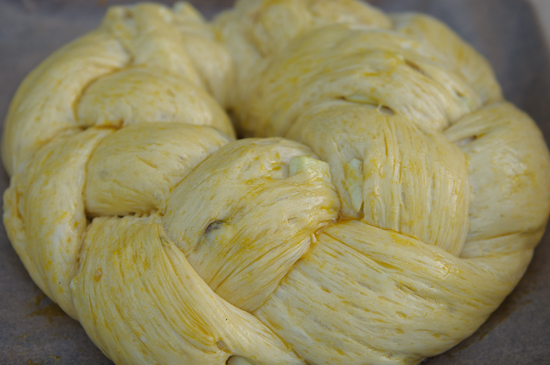 And your challah is gorgeous – extra delicious with honey and eggs from your bees and chickens. I use our hens’ eggs in our challah and always marvel at how golden the dough becomes. L’shana tova!